Great home for a large family or 2-3 families with kids, yet not too big for a couple that wants to get away and enjoy a house rather than a small condo and still be almost right on the beach! 3/28: Enjoy a beautiful covered front porch. 12/28: Large master bedroom with king bed, private master bath, access to 2nd floor deck on front of home with ocean views. 13/28: Large master bedroom with king bed, private master bath, access to 2nd floor deck on front of home with ocean views. 14/28: Large master bedroom with king bed, private master bath, access to 2nd floor deck on front of home with ocean views. 15/28: Master bathroom on 2nd floor of main house. 16/28: 2nd floor deck on front of house off master bedroom. 18/28: Spacious bunk room with two closets, dresser, TV and private full bath. 19/28: Queen bedroom on main floor in main house. 20/28: Queen bedroom on main floor in main house. 21/28: Full bath on main floor in main house. 22/28: Living room in carriage house with kitchenette, mini fridge, and bistro table. 23/28: Living room in carriage house, queen sleeper sofa. 24/28: Full bath in carriage house. 28/28: Sirenia is so close to Shirah Street beach access in Crystal Beach, Destin, Florida. Property Size 2,378 sq. ft.
An ideal home for 2-3 families with children or groups of 12 adults max. You’ll enjoy a true beach vacation in this spacious, cottage-style home, just steps from the beach! This home is in the heart of Crystal Beach, a quiet, walkable neighborhood with white picket fences and easy access to shopping, restaurants, and activities in Destin. Sirenia is a large home, sleeping up to 16, with a sunny private pool, and a separate carriage house. It’s perfect for large or multiple families, or folks who just want a lot of space to spread out. It even comes with a 4-passenger golf cart! The main house has a queen bedroom and a full bathroom downstairs, and upstairs you’ll find a large king master bedroom with ensuite bathroom and a large bunkroom with 2 full-over-full bunk beds and a New queen bed. The bunkroom also has a full bathroom attached. The separate carriage house has a king bedroom, a full bathroom, living area, and kitchenette. When you arrive, you’ll immediately appreciate the beach view from the front porch - Adirondack chairs invite you to relax and switch to vacation mode. Inside, you’ll find a large open living and dining area with plenty of comfortable seating and an HDTV and blue-ray player. The large dining table seats 8 with space for more at the kitchen counter. The NEWLY RENOVATED kitchen features stainless steel appliances and new quartz countertops. The kitchen counter is now all one height, opening the kitchen to the living spaces & providing more prep and dining space. You’ll find all the dishes, pans and utensils you may need, a Keurig D-Cup coffee maker, and even a few spices, to get you started. We want you to feel at home, and the large, open layout is a perfect gathering spot for your family or friends. Follow the extra-wide central hallway to the back of the home to find this lovely bedroom. It features a comfortable queen bed, a dresser, a roomy closet and a nightstand with a lamp. You can relax in here with the HDTV and DVD player. There’s a full bathroom in the hallway next to this bedroom. This spacious hall bathroom includes a commode, tub/shower combination, and a sink with an extra-large vanity. There are large fluffy bath towels, a personal hair dryer, and ample storage in this clean, bright bathroom. Upstairs, at the front of the home, you’ll find the large, comfortable master bedroom with an inviting king bed, night stands and lamps. There is even a desk and an internet-connected PC in this room, in case you need to do a little work or check emails while on vacation. Plenty of windows bring in the light, and you have your own private access to the lovely balcony where you can enjoy your morning coffee or relax after a day at the beach. There is also an HDTV with DVD player and a large dresser in this room, as well as a walk-in closet in the ensuite bathroom. This roomy bathroom features an extra-large vanity with double sinks and drawers, a linen closet, commode, bathtub, and separate shower. You’ll appreciate the size and convenience of this bathroom, as well as the big fluffy bath towels and personal hair dryer. Down the wide hallway from the Master Bedroom, this super-size bunk room features two full-over-full bunks (yes, that's 4 full-size beds!) and a new queen bed, so there’s room for up to 10 children. They will love having this space to hang out when they’re not outside enjoying the Destin sunshine. There’s a wall-mounted flat screen TV, two roomy closets and plenty of floor space to spread out. The bunk room also has its own private full bath. This bathroom is attached to the Bunk Room and is equipped with a commode, vanity and sink and tub/shower combination. There is also a personal hair dryer and large fluffy bath towels for bunk room guests. This lovely Carriage House is next to the private pool behind the main house. Inside you’ll find a comfortable living area with a queen sleeper sofa and kitchenette with small fridge, sink, toaster, coffee maker & microwave. A small table and chairs make a great spot for morning coffee or a snack. There’s also a NEW King bedroom and full bathroom in this extra house, and you can just step outside to enjoy the pool! This beautiful, bright bedroom features a BRAND NEW KING BED and a large nightstand with a reading lamp. You’ll have plenty of space to settle in with the large dresser, and there’s a big walk-in closet across from the full bathroom. This cheery bathroom includes a commode, sink and tub/shower combination. This bathroom is nice for guests sleeping in the Carriage House, and also very convenient when you’re spending time out by the pool. You’ll also find a personal hair dryer and big fluffy bath towels in this bathroom. You’ll find the private, professionally maintained swimming pool nestled in the beautifully landscaped backyard. It’s all yours – enjoy it! There’s plenty of space to spread out around the pool with lounge chairs and 2 dining sets. A large gas grill on the back porch of the main house helps make dinners easy. There are even a bistro table and chairs – another perfect spot for morning coffee or evening relaxing while grilling and watching the children in the pool. Pool heat is available for an additional fee. This home has a driveway which accommodates 3-4 vehicles (depending on the size of the cars.) There is no on-street parking allowed in Destin. 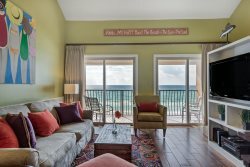 Crystal Beach is the gold standard of Destin...no high-rise condominiums or beaches packed with 4 rows of vendor chairs. Crystal beach is mostly residential, which contributes to the quietness of the neighborhood. Just a few steps away is the Shirah Street beach access, and the larger ‘Shore at Crystal Beach Park’ with a pavilion and bathrooms is just a block from there. Restaurants, activities and entertainment are also close-by. Destin Commons, a beautiful upscale shopping and entertainment center, is less than a half-mile away. It features over 75 shops and restaurants, including Bass Pro Shop, World of Beer, Panera Bread, Uncle Buck's Fish Bowl & Grill, AMC Theater with IMAX and much more. Local favorite, Camille’s, is an easy walk and The Crab Trap is about a mile east. You can bicycle, scooter, Jet ski and go para-sailing all within walking distance. The Silver Sands Outlet mall is not far for those who enjoy “retail therapy”! The name of our home, Sirenia, comes from sirens - the singing sea creatures - and was chosen by our daughter and her friends. We offer a small number of first-class vacation homes in Crystal Beach. If this home is not perfect for you, please see the link to 'All My Rental Listings' below. We own our homes and take exceptional care of them. No one offers better homes than we do. We're local and will stop by and say 'hi' so we have to be proud of our homes. Can't wait to come back to another one of the properties owned by these nice people. This was the easiest check-in and out we have had. Staff was so nice and knowing they are close in the neighborhood was comforting. We really enjoyed your house and would love to stay with you again! The team was courteous and very responsive. We had everything we needed at the beach house. It was lovely and we look forward to vacationing there again. Very easy to work with and the owner Jeff Was very helpful to us with any request. Beautiful Home . We hope to be in the exact same place next year. It was our first time to Destin and it was all that we had been told! Beach was beautiful and house was great.The house has been remodeled and every thing was brand new.Jeff was awesome to deal with he was their to greet us and if we needed anything he was quick to respond!The house is so close to beach,shopping,grocery store and great restuarants!perfect location and i would definitely stay here again!! We offer a small number of first-class vacation homes in Crystal Beach. If this home is not perfect for you, click here to see all our properties. We own most of our homes, and are local, so we take exceptional care of them. No one offers better homes than we do. We will greet you here and make sure everything is just right.